This article is about the thirteenth-century theologian John Duns Scotus. For the ninth-century Irish theologian also sometimes referred to as John Scotus, see Johannes Scottus Eriugena. John Duns Scotus (c. 1266 – November 8, 1308) was one of the most important Franciscan theologians and the founder of Scotism, a special form of Scholasticism. He was a philosopher and logician, known as "Doctor Subtilis" because of his subtle merging of differing views. 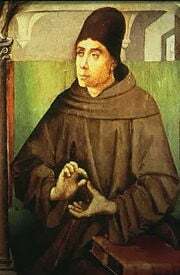 Duns Scotus made important contributions to epistemology by undermining the Augustinian concept of divine illumination of the intellect, laying out a detailed explanation of how certitude can be based on the knowledge of self-evident proposition, induction and awareness of our own intellectual state. Duns Scotus proposed the concept of "intuitive cognition," an existential awareness of intelligible objects, which later influenced the artistic world. He also gave will priority over intellect, saying it was the only true rational power because it had the capacity to choose between opposites. He argued that God had the power to do anything God willed. To the medieval concept of "essence" and "existence," Duns Scotus added a principle of individuation to the common nature of essence, “haecceitas” or “thisness," which defined the uniqueness of each being apart from its material existence. This concept opened the way for the idea of individual salvation. Some argue that during his tenure at Oxford, the systematic examination of what differentiates theology from philosophy and science began in earnest. Later philosophers were not so complimentary about his work, and the modern word dunce comes from the name "Dunse" given to his followers. There is very little known about the life of Duns Scotus. Scotus’ birthplace has long been a topic of discussion. The name “Scotus” can be simply understood as a nickname, identifying Scotus as a Scot. His family name was Duns, meaning “Scottish village.” However, the name Scotus was commonly applied not only to Scotsmen, but to Irishmen and even people from northern England. There are also discussions of whether Duns was a family name or a place name. These arguments have been tinged with nationalistic feeling since the beginning of the sixteenth century, because each region would like to lay claim to one of the most famous thinkers of the medieval era. The first historical record of Duns Scotus is his ordination to the priesthood in the Franciscan Order of Friars Minor on March 17, 1291, at St. Andrew’s Church in Northampton, England. As the Bishop of Lincoln had ordained priests in Wycombe on December 23, 1290, and the minimum age for ordination was 25, it is thought that Duns Scotus’ birth must have been no later than March, 1266. Duns Scotus spent 13 years (1288-1301) at Oxford University, the principal house of studies for the Franciscan province in England. His formal studies at Oxford concluded them in June, 1301. In the academic year 1298-1299, he lectured on Peter Lombard’s Sentences, the main textbook of theology in the universities of the Middle Ages. A talented candidate, Duns Scotus was appointed to the Franciscan chair of theology at the University of Paris, a major academic center during the medieval period. He gave commentaries on the Sentences there from the autumn of 1302 until June 1303, when the university was seized by the long-suppressed antagonism between King Philip IV the Fair and Pope Boniface VIII. Philip arrested Jews in order to claim their assets and use them to support his military. Some leaders of the Catholic Church reproached him for his wasteful habits. When he levied taxes on the French clergy of one-half their annual income, the Roman Catholic Church and the papacy protested. On June 24, 1303, an antipapal demonstration took place, and friars paraded in the streets of Paris. Royal commissioners visited to investigate members of the Franciscan house. About seventy friars sided with Philip, and eighty remained loyal to the Pope, among them Duns Scotus. In June 1303, Duns Scotus was expelled from France together with the eighty other friars who had sided with the Pope. It is not known where Duns Scotus spent this time of exile. Duns Scotus and others were allowed to return to Paris in April 1304, where Duns Scotus completed his lectures on the Sentences. On November 18, 1304, Scotus was designated the Franciscan Regent Master in Theology at the University of Paris. For unknown reasons, he was appointed professor at Cologne, Germany, in 1307. Some scholars think that Gonsalvus sent Scotus to Cologne for his own safety, because of his controversial assertion that Mary need not have contracted original sin. This claim was immediately challenged by his Dominican colleagues, and some scholars even labeled him a heretic. Scotus lectured at Cologne until his death in 1308. He died in Cologne and is buried in the Church of the Minorites in Cologne. His sarcophagus bears the Latin inscription: Scotia me genuit. Anglia me suscepit. Gallia me docuit. Colonia me tenet, translated as "Scotia (Ireland was referred to as Scotia until the thirteenth century) brought me forth. England sustained me. France taught me. Cologne holds me." He was beatified by Pope John Paul II on March 20, 1993. The Middle Ages was characterized by several theological debates concerning theological points of view. The theology of St. Augustine was at first in the mainstream, but Aristotelianism gradually appeared in contrast. The Franciscan order represented the theology of Augustine, and the Dominican order supported the theories of Aristotle. Following this theological trend, Bonaventura of the Franciscan order conflicted with Thomas Aquinas of the Dominican order. This theological struggle transferred itself to Scotism and Thomism. Duns Scotus belonged to the Franciscans and Thomas Aquinas was a Dominican. Their theological conflict, concerning the relative importance of intellect and will in God and man, had a deep impact on the development of modern theology. Thomas introduced the church to Aristotle’s rationality, which asserted that Man is man qua intellect ("Intellect is what distinguishes man from all other beings"). Duns Scotus and the Augustinians asserted that it is will that distinguishes God and man, and that will takes priority over intellect. These debates were argued mainly over points of epistemology. Thomas Aquinas argued that because man has intellect, he can be distinguished from animals. Duns Scotus opposed Thomas’ opinion, insisting that God’s potentia absoluta (absolute power), or will, has precedence over God’s potestas ordinate (ordered power) or intellect. The absolute power of God is behind the ordered power, and can modify everything. The world is thus created by will. Scotus argued that will, which had the capacity to make a choice between opposites, was the only truly rational power, while the intellect was a purely natural function. Scotus also defined the will as having an innate tendency towards the ultimate good, separate from any advantage that might accrue to the agent; this freed the will from determinism since it did not by necessity act only for the perfection and fulfillment of the agent. In this concept of the absolute power of God we have the origin of positivism in all aspects of culture. Duns Scotus explored new approaches to theology, centered on the assumption of the priority of divine will. One example is the idea of merit, a human’s moral and ethical performance which is considered worthy of receiving a reward from God. Thomas Aquinas posited that the divine intellect knew the inherent worth of a human’s moral and ethical performance, and informed the will to reward it judiciously. Duns Scotus, on the other hand, said the divine will to reward moral and ethical performance came before any assessment of the performance’s inherent worth. The ideas of Duns Scotus were significant to the doctrines of justification and predestination. Scotus is usually associated with voluntarism, the tendency to emphasize God's will and human freedom in all philosophical issues. The earlier Middle Ages were dominated by Augustine’s “illuminationism,” in which knowledge was thought to arise from the illumination of human intellect by God. This view, which was defended by theologians such as Henry of Ghent, was criticized by Duns Scotus. Duns Scotus denounced Henry’s theory as leading to skepticism (skepticism), and gave a methodology for establishing certitude apart from illumination. He based certitude on the knowledge of self-evident proposition, induction and awareness of our own situation. In addition to his dismantling of the concept of illumination, Duns Scotus’ contribution to epistemology was called “intuitive cognition," in contrast to "abstractive cognition." He argued that the intellect naturally undertakes reasoning that makes reference to the real existence of specific sensible objects. Abstractive cognition cannot supply such knowledge. Duns Scotus is categorized as a realist on the problem of universals. He is one of the major opponents of William of Ockham’s nominalism; ironically, Duns Scotus’ concept of individuation had the effect of promoting Ockham’s theory. Avicenna (a Persian philosopher who followed Aristotle), outlined a theory of the common nature, according to which the essences of things have an independence and priority to their material existences. Duns Scotus clarified that these essences, or natures, as common, must have their own proper unity. Natures are common prior to any act of the intellect but have their own real, lesser unity; they require a principle of individuation. Duns Scotus renounced the regular opinion that essences, or common natures, are distinguished into unique entities by their actual existence, quantity and matter. He defined a principle of individuation, a further substantial difference added to the essence, an “individual difference” called “haecceitas” or “thisness.” The concept of haecceity, or an entity's "thisness," its particularity, can be contrasted to quiddity, the entity's "whatness," or universality. Perhaps the most influential point of Duns Scotus’ theology was his defense of the Immaculate Conception of Mary. At the time, there was a great deal of argument about this subject. The general opinion was that it was appropriate that Mary be a virgin when she conceived Christ, but it could not be seen how to resolve the problem that only with Christ's death would the stain of original sin be removed. The great philosophers and theologians of the west were divided on the subject (indeed, it appears that even Thomas Aquinas sided with those who denied the doctrine, though some Thomists dispute this). The feast day had existed in the East since the seventh century and had been introduced in several dioceses in the West as well, even though the philosophical basis was lacking. Citing Anselm of Canterbury's principle, potuit, decuit, ergo fecit ("God could do it, it was appropriate, therefore he did it"), Duns Scotus devised the following argument: Mary was in need of redemption like all other human beings, but through the merits of Jesus' crucifixion, given in advance, she was conceived without the stain of original sin. This argument appears in Pope Pius IX's declaration of the dogma of the Immaculate Conception. Pope John XXIII recommended the reading of Duns Scotus' theology to modern theology students. Duns Scotus, John, A. Jaczn, A. Vos, H. Veldhius, A. H. Looman-Graaskamp, E. Dekker, N. W. den Bok. Contingency and Freedom. Lectura I 39. The New Synthese Historical Library 4. Dordrecht/Boston/London: Kluwer, 1994. All retrieved May 15, 2018. History of "John Duns Scotus"